This simple childs raglan jumper pattern is rated as an intermediate knit as it has some shaping and is knitted in stocking stitch. The jumper consists of four pieces, the back and the front, and two sleeves. The style of the jumper is a raglan, which basically means that the top of the front, back and sleeves are shaped in a diagonal from the beginning of the armhole to the neck. This style of jumper tends to offer a better fit than either the dropped shoulder or inset sleeve styles, and raglan shaping is easier to do that it appears. 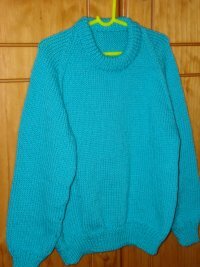 The jumper in the picture is a size four and was knitted using Carnival 8 ply pure wool. Using 3.25mm Needles, cast on 69 (77 – 83 – 91 – 97 – 103) sts. Work in stocking stitch until work measures 21 (23 – 25 – 27 – 29 – 31) cm from beg, ending with a purl row. 3rd row – K2, sl 1, K1, psso, knit to last 4 sts, k2 tog, K2. Rep last 4 rows 2 (1 – 2 – 1 – 2 – 2) time/s… 57 (67 – 71 – 81 – 85 – 91) sts. Dec (as before) at each end of next and alt rows until 23 (23 – 25 – 25 – 27 – 27) sts rem. Work 1 row. Leave rem sts on stitch-holder. Dec (as before) at each end of next and alt rows until 45 (45 – 49 – 49 – 53 – 53) sts rem. Work 1 row stocking stitch. Shape Neck – 1st row – K2, sl 1, K1, psso, K13 (13 – 15 – 15 – 17 – 17) turn. Cont on these 16 (16 – 18 – 18 – 20 – 20) sts. 3rd row – K2, sl 1, K1, psso, knit to last 2 sts, sl 1, K1, psso. Rep 2nd and 3rd rows until 8 sts remain. Dec (as before) at armhole edge only in next and alt rows until 3 sts rem. Next row – K1, sl 1, K1, psso. Next row – P2, turn, K2 tog. Slip next 11 sts on to stitch-holder and leave. Join yarn to rem sts and knit to last 4 sts, K2 tog, K2. 3rd row – K2 tog, knit to last 4 sts, K2 tog, K2. Rep 2nd and 3rd rows until 8 sts rem. Dec (as before) at armhole edge only in alt rows until 3 sts remain. Next row – K2 tog, K1. Next row – Rib 4 (4 – 6 – 6 – 8 – 4), * inc in next st, rib 3, rep from * to last 1 (3 – 3 – 5 – 5 – 3) st/s, rib to end … 45 (47 – 49 – 51 – 53 – 57) sts. 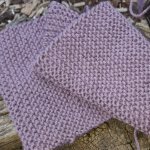 Cont in stocking stitch, inc (as before) at each end of foll 8th (10th – 10th – 12th – 10th – 10th) rows until there are 57 (59 – 63 – 65 – 71 – 69) sts. Sizes 12 only – then in foll 12th rows until there are 75 sts. All sizes – Cont without shaping until work measures 23 (28 – 33 – 38 – 40 – 42) cm or length desired, from beg, ending with a purl row. Shape raglan – Cast off 3 sts at beg of next two rows. Rep last 4 rows 0 (2 – 3 – 5 – 5 – 6) time/s… 49 (47 – 49 – 47 – 52 – 55) sts. Dec (as before) at each end of next and alt rows until 7 sts rem. Work 1 row. Cast off. Using back-stitch, join raglan seams, leaving left back raglan open and noting that tops of sleeves form part of neckline. With right side facing and using 3.25mm Needles, knit up 90 (90 – 96 – 96 – 102 – 102) sts evenly across around neck, incl sts from stitch-holders. Rep 1st row 16 (16 – 16 – 20 – 20 – 20) times. Cast off lightly in rib. With a slightly damp cloth and warm iron, press lightly. Using back-stitch, join left raglan seam. Join side and sleeve seams. Fold neckband in half to wrong side and slip-stitch in position. Press seams. I hope you enjoy using this simple childs raglan jumper pattern. If you would like to download a printable version of this pattern, just click on this link. Just in case you would like to print out a copy of this Simple Childs Raglan Sweater pattern, I have created a pdf version of it that you can download.